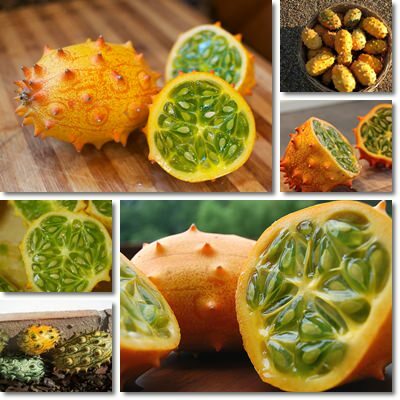 The horned melon fruit, commonly referred to as kiwano (Cucumis metuliferus) is an otherworldly presence in the fruit world. Just a little more nutritious than your regular apple, this yellow-horned fruit with a green, jelly-like consistency and a peculiar flavor is definitely worth a taste. Kiwano is known by many names, including horned melon fruit, jelly melon or simply melon, melano, blowfish fruit, hedged gourd and African horned cucumber. Most of them stem from the fruit’s peculiar appearance, reminiscent of both melons and cucumbers, with which it is actually related. The last one refers to its place of origin which is south of the Sahara desert. Although it is now being cultivated on a relatively larger scale in other hot places such as Australia, New Zeeland, parts of South America and, more recently, in the hottest states in the US, kiwano remains a sun and drought-loving fruit of African descent. What does kiwano look like? As you may have already noticed from the images above, kiwano resembles both a cantaloupe melon and a cucumber. It has a round or oval shape, bright yellow or orange colored skin when ripe, green when unripe and is about the same size as a smaller melon. The horns or spikes on its skin are similar to those found on some cucumber species; its lime-green, jelly pulp has the same texture as overripe cucumber pulp, while its relatively large, flat, whitish seeds resemble those of both melons and cucumbers. Judged by its characteristics, kiwano is basically half cucumber, half melon. Even more, the fruit grows on a vine, just like both of its relatives. What does kiwano taste like? If its appearance wasn’t peculiar enough, know that this half-melon, half-cucumber fruit tastes even more interesting than it looks. This being said, the general agreement is that kiwano tastes like cucumber, banana and lemon with possible hints of zucchini, kiwifruit or melon. Very few people describe kiwano as having a tart flavor. Keep in mind that taste is something very personal and there are people who perceive hints of flavor in various foods that others simply miss. It is all about perception. And ripeness. If the fruit is not yet fully ripe, then it will not have a good taste. If perfectly ripe (yellow orange, with seeds bursting when cut and squeezed), kiwano is an interesting combination of a gelatinous or jelly-like-textured pulp reminiscent of cucumbers, melons, bananas and kiwifruit. Seen that it is about 89% water, it is also quite thirst-quenching. Also, many people have reported that the fruit’s gelatinous texture has helped soften stools and even improve bowel movement habits by relieving constipation. What does kiwano smell like? Those of you with a more sensitive smell will probably notice that perfectly ripe kiwano gives off a rather sweet smell reminiscent of ripe bananas. This is also a great way to tell if the fruit is ripe. How to eat kiwano? You will first need to wash your kiwano to prevent any germs or pesticides on the skin from getting into your fruit when cut open. Take a knife and cut the fruit in half; if necessary, you can remove the spikes on the skin as well, thus preventing a potential injury. Take one half of the fruit and either scoop its pulp out with a spoon or squeeze it until its green, jelly-like pulp comes out by itself, together with the seeds. You can enjoy the fruit as it is, add it to fruit salads alongside bananas, mango and so on or use it to garnish steaks or grilled chicken. Kiwano pulp, seeds and even skin are all edible. 1) Rich in antioxidants. 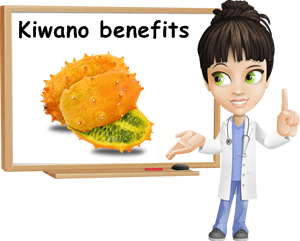 Kiwano was found to contain α-tocopherol and y-tocopherol, two forms of vitamin E with great beneficial effects on human health. It is well-known that vitamin E protects the skin from UV radiation, preventing free-radical cell damage and protecting against prostate cancer and Alzheimer’s disease. It promotes growth and both physical and mental development. Kiwano also contains small amounts of vitamin A and its antioxidant carotenoids, beta-carotene, lycopene and lutein, all of which help protect and repair DNA, slowing down the cellular aging process. 2) Good source of essential minerals. Kiwano contains good amounts of iron (9%), magnesium (11%), phosphorus (5%), potassium (3%) and zinc (5%). Iron improves the blood’s oxygen-carrying capacity, resulting in good muscle functioning. Magnesium supports the activity of every single muscle in our heart, especially that of the cardiac muscle (heart) and contributes to improved calcium absorption. Phosphorus ensures healthy bones, while potassium regulates body fluids and blood pressure. Zinc is essential for good immunity, supports smell and taste and is essential for good protein synthesis and cell growth. For more information on vitamins and minerals and their functions, feel free to access this page. 3) Helps slow down cellular aging. Thanks to its vitamin C content, kiwano helps protect cells from free radical damage, lower chronic disease risks and regenerate vitamin E deposits; it improves iron absorption, boosts immunity, lowers cholesterol and overall heart disease risks and increases collagen production, resulting in younger, more elastic skin. Conclusion. Although not as nutritious as spinach or kiwifruit, kiwano is a great choice for a healthy diet. Eating it on a regular basis provides no health risks, only benefits and an interesting taste experience. If you do manage to get your hands on one, eating it will surely prove to be an unforgettable taste experience.